Spring Specials! Everything under one roof! Looking for something special to transform your House into a Home? Over 30 years experience, all our fitters have Full Diploma in fitting Child Safe Blinds. Unable to get out? Don't worry, we come to you! Our Home Call Service is a speciality, choose in the comfort of your own home. Upholstery service for suites, chairs & much more. Child Safe Blinds! NEW Range of Remote Control Mirage Blinds. No cords or chains. Shutters, fly screens, security grilles. For Spring 2019, we have negotiated fantastic discounts on several leading brands. Step into Spring with Fresh New Fabrics. Our stunning new collections have just arrived! 7 day made to measure service by our own professional seamstresses with over 30 years experience. 20% off all Cormar Carpets ordered before 31st May 2019. We move your furniture and put it all back in place. We also dispose of your old carpets. 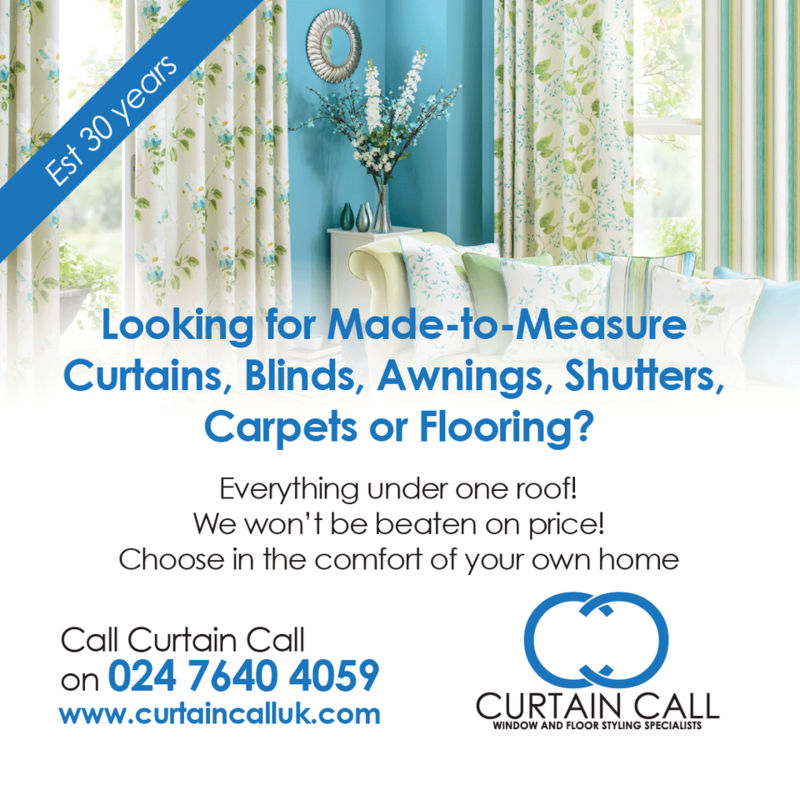 "To Keith and all at Curtain Call, thank you for your impeccable service and product delivery and fittings. John and I are extremely delighted with the curtains. You have certainly delivered on all aspects of service and will come highly recommended by us." "Just a note to say thank you for installing our curtain pole and curtains so professionally. I was impressed with the care and attention you took, it was nice to see and receive such a high level of service. I shall definitely recommend you and come to ‘Curtain Call’ first for any other windows we need dressing! Thanks again." "As usual Keith and the team at Curtain Call have done an absolutely superb job, and we are so pleased with the results of our carpets and curtains. Thanks also for organising the shutters in the lounge, the results are stunning." "Many thanks for the excellent jobs carried out. The carpet, chair and blinds are first class." "Dear Keith and your wonderful staff at Curtain Call. Thank you so much for a job well done along with all your help and advice. Thanks also for the kind and friendly way that everyone dealt with us, a rarity these days and much appreciated by two ‘oldies’." "To all at Curtain Call. Thanks very much, my carpets look fantastic, and thanks also for taking my old carpets up and disposing of them for the work to be carried out!" "Thank you so much for the work carried out on our conservatory blinds, we are so pleased with them."